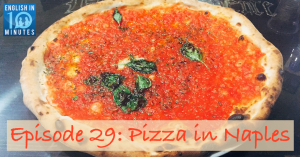 Nick and Wendy talk about traditional Italian pizza from the city of Naples and about how it’s different from American pizza. They also discuss the concept of cucina povera (‘poor man’s cooking’) in Italian cuisine. The episode comes with a worksheet containing a transcript of the conversation, analysis of the best vocabulary, and discussion questions to help you make the most of the conversation.